In May 2018, Lenna was diagnosed with celiac disease. Lenna is a very rare case, as celiac disease is usually diagnosed in children that are 4 to 6 years of age, and she was only 21 months. Her parents first noticed that Lenna started to become very irritable. She also had no interest in doing much of anything and her energy was completely gone. In April 2018, Lenna started to vomit. Her vomiting progressively got worse to where she was vomiting every day. After an x-ray, ultrasound, CAT scan and blood work, she was admitted to the hospital, where she finally receive the diagnosis of celiac disease. Lenna was only days away from small intestinal failure, and it will take up to a year for her small intestine to fully recover. Within 48 hours of being on a gluten-free diet, Lenna returned to being a fun, smiling, energetic girl and is currently doing great. Lenna’s parents hosted a 5K in September 2018 to raise awareness and funds for celiac disease. They raised over $1,500, which directly funds research, education, and advocacy, so that those living with celiac disease, like Lenna, can have a better quality of life and one day, a cure. Jordan, a 13-year-old hockey player, does not let living with celiac disease slow her down. She puts her energy into making difference in the lives of those with celiac disease and held an event called “Jordan’s Skate for a Cure” for her birthday in August 2018. She raised over $400 at the event, and in addition to her online donations, has raised $2,200 for celiac disease research! We are grateful to have ambitious young leaders like Jordan in our celiac community and are appreciative of her hard work as a Team Gluten-Free member. 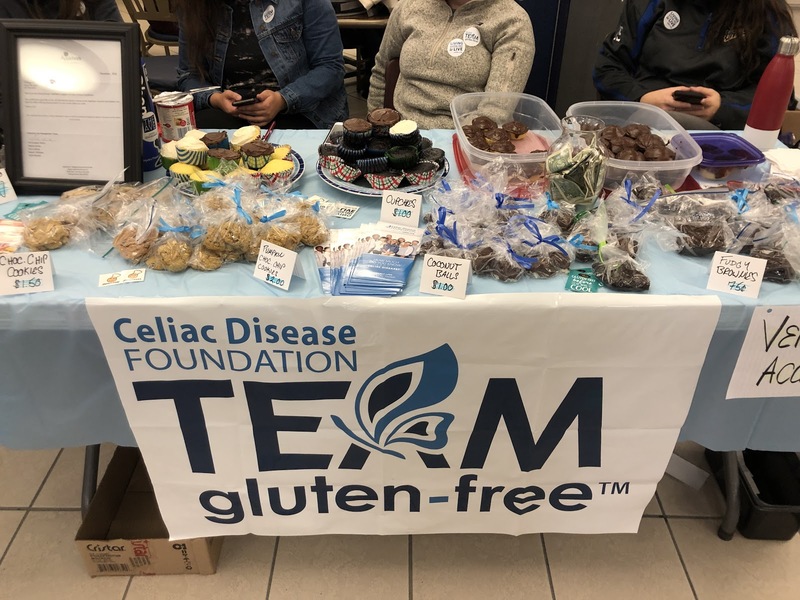 As a TGF member, Lara was thrilled to contribute to the celiac disease community through a bake sale at the University of Maine’s campus. She offered gluten-free baked goods, with some also being dairy and egg-free, and ingredients were listed for every food item. Not only did the event raise over $150 through donations and bake sale purchases, but the informational celiac disease brochures also assisted in educating customers/peers. 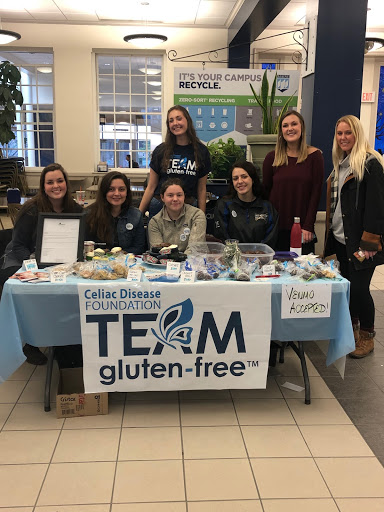 The Team Gluten-Free banner and apparel drew people in, and a few students even asked if they could get a picture of the booth to send to their friends and family with celiac! After years of being sick and in pain, Holden was diagnosed with celiac disease. Living with celiac disease can be challenging: from finding safe restaurants and traveling while maintaining a strict, gluten-free diet, to ensuring people understand that celiac disease is not just an allergy or something you can grow out of. Something that helps Holden stay positive while facing these challenges is his dad’s incredible cooking. Holden’s dad used to be a cook in restaurants and is now making delicious gluten-free meals for his son. Holden’s goal as a member of Team Gluten-Free is to raise funds for research and a cure, in hopes that future generations will not have to struggle like he did. He has raised over $3,300! We are grateful for his hard work and dedication to raising funds that helps us fund research for adjunct treatments and one day, a cure. Ariel Spiegelman is a high school junior in Long Island, New York. Ariel was diagnosed with celiac disease in the fall of 2016. 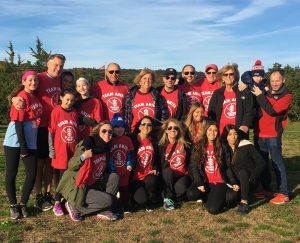 Before she even had time to grasp her new reality, Ariel jumped at the opportunity to support the Long Island inaugural Celiac Disease Foundation Turkey Trot and returned again in the fall 2017 event, being the top fundraiser for both events. With the support of her family, friends, and community, Ariel continues to demonstrate her commitment to help find a cure for celiac disease. Ariel continues to show her dedication to the celiac disease community by volunteering at the Ronald McDonald House Long Island, where she cooked a gluten-free meal for 85 guests. The Celiac Disease Foundation had the honor of presenting Ariel Spiegelman the Foundation’s Volunteer of the Year at the 2018 National Conference and Gluten-Free EXPO. Thank you, Ariel, for your support of the Celiac Disease Foundation! Thanks to Julie McCormack for raising money for Celiac Disease Foundation at the AITI Golf Outing in Chicago for the past three years. The 2017 event had 118 golfers and raised almost $9,000. The event included golf contests, a raffle, and a poker run. Julie became involved with Team Gluten-Free because her daughter was diagnosed with celiac disease. During the event, she learned that other golfers also had children with celiac disease. She is passionate about her support for the Foundation and is eager to increase the rate of diagnosis in celiac disease. We are grateful for Julie’s hard work and look forward to the 2019 Golf Outing. Along with her two friends, Haley Glowacki and Megan Driscoll, Alex Morris planned the second 5K RAGE Against Celiac Disease in Naperville, IL. RAGE stands for Race for Answers to Gluten Enteropathy. The race took place on a day designated as Celiac Awareness Day by the Naperville City Council, which honored the runners for their work raising awareness for celiac disease. Alex, at age 12, launched the 5k RAGE in 2014. What began as a bat mitzvah service project and a fundraiser for the Celiac Disease Foundation (raising nearly $10,000) made a return because she wanted to do more. Alex and her friends did an incredible job building celiac disease awareness in their community while supporting the Foundation and having a fun run. They raised an additional $10,000 at their 2017 5k RAGE. Thank you, Alex, Haley, and Megan! With friends and family, Shira trained to run a 5k in support of her daughter, Ayelet, and all others who are living with celiac disease. “Even though Ayelet has been diagnosed with a chronic illness, she shines wherever she goes and touches many with her smile and spirit.” In order to find a cure for Ayelet, and the millions of others who are at risk of long-term health problems, who need to be viligant about every bite they eat, never getting a vacation from being careful about every single morsel that goes in their mouths, Shira raised more than $1,700. While they were fortunate that Ayelet was diagnosed within a year of her symptoms, most are not that fortunate and the average time to diagnosis is nearly 10 years! In fact, of the 3 million Americans with celiac disease, only 1 in 5 are diagnosed. Thanks to a strict gluten-free diet, Ayelet is on a path to healing. No child or adult should suffer from a debilitating disease with lasting health repercussions. 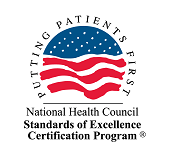 It is because she remains hopeful that, together with the Celiac Disease Foundation, the health and quality of life for people with celiac disease can be improved. Thank you, Shira and the Ravera family, for your support of the Foundation! During the summer between fourth and fifth grade, Jake’s parents became concerned with his small size and skinny frame. The family doctor said that he had not grown in three years, and only weighed 50 pounds. For the next several months, Jake’s mom took him to many specialists. By the following January, he had a biopsy of his small intestine that confirmed he had celiac disease. The doctor told him there was no cure and he must adhere to a strict gluten-free diet. This was very difficult for an eleven year old, but with the help the Celiac Disease Foundation, they found information on how to not only eat gluten-free but hope for a cure. Every year the Castleman Family attends the Annual Celiac Disease Foundation Gluten-Free EXPO in Southern California. Through this event, Jake has been able to see that he is not alone as a teen. He jumped at the chance to help raise money for the Foundation as a Student Ambassador. In his community, and even in his extended family, most people do not understand what celiac disease really is. Raising money and spreading the word is so important! Not only reached did Jake hit his fundraising goal, but also surpassed it, raising $1,350. This year, his goal is to become more involved and educate more students and teachers at his school. He also plans to continue next year when he goes to college.